“Bailey” in training at K9 training school. DGIF’s Conservation Police Officers needed a few good dogs—and after searching far and wide they found two exceptional pups. K9 ‘Sky’ and K9 ‘Bailey’ are both female black labs. They were selected from hundreds of potential candidates for their intelligence, energy, and strong ‘play’ drive. 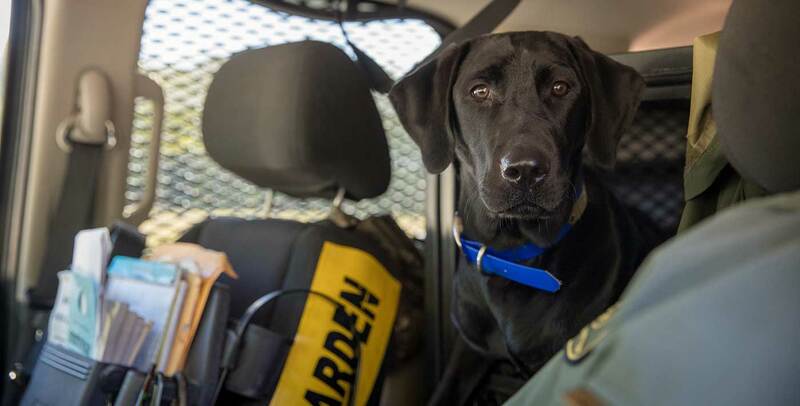 Since DGIF began the K9 program in 2011- the K9s have played a huge role in search and rescue operations, as well as investigating hunting incidents and solving wildlife crime. ‘Sky’ is set to play a huge role in the DGIF K9 program. DGIF’s K9s have saved lives by tracking lost hunters and missing children. They also use their noses to solve crime by locating guns and shell casings—essential skills when a hunting incident has occurred. Generous donors The Ward Burton Wildlife Foundation and The Hansberger Family stepped forward to help purchase the dogs. Both have a passion for conservation and wanted to express their support for Virginia’s Conservation Police Officers. CPO Richard Howald, ‘Sky’, and The Hansberger Family. The officers who handle K9s live with them and work with them every day. The dogs even wear a conservation police shield around their neck to identify them as police dogs. Ward Burton, ‘Bailey’, and CPO Jim Patrillo. CPO Richard Howald will be Sky’s handler and CPO Jim Patrillo will be training Bailey. Both officers have been putting the dogs through their paces in the K9 training school in Indiana.